Using React allows you to simply express how your app should look at any given point in time. React will automatically manage all UI updates when your underlying data changes. When the data changes, React conceptually hits the “refresh” button, and knows to only update the changed parts. It is very important that we understand the thought process of building web apps with React. Here’s a start: We start with a mock. Then, we break the UI into a component or parts of the UI. In the following image, you can see the mock and components in colored boxes. Here we will learn how to create, read update and delete database records – CRUD operations with PHP, MySQL, React, Babel, jQuery and Bootstrap. React don’t make assumptions about the rest of your technology stack. 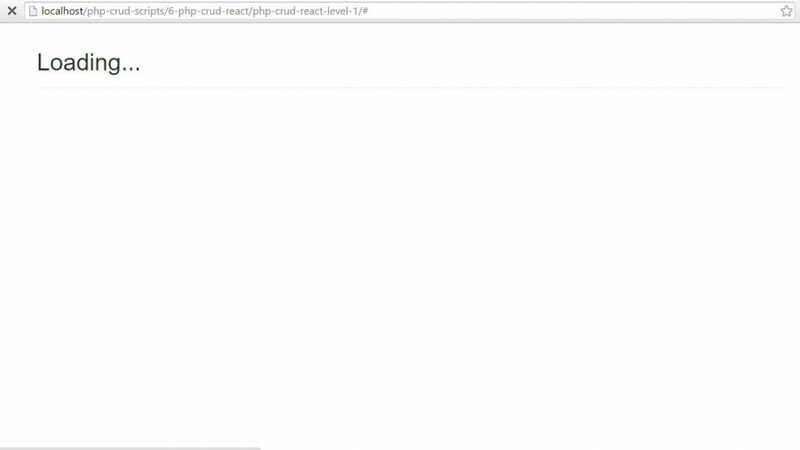 PHP – will handle server side script. MySQL – will store our data. React – will make our UI fast and interactive. jQuery – will do AJAX requests. React official docs shows jQuery examples. Bootstrap – will make our UI look better. It is useful to see the final file structure of this React CRUD tutorial. This way, we can easily visualize where we are going. You do not need to memorize all the files or folders. You just have to understand them. Folders and files are in bold characters. I put a small description of each files and folders. Once we complete the tutorial, we will have the file structure that looks like the following. ├─api/ – contains PHP files that works with the server. ├───create_product.php – will insert data to MySQL database. ├───delete_products.php – will delete data from MySQL database. ├───read_all_categories.php – will select categories from MySQL database. ├───read_all_products.php – will select products from MySQL database. 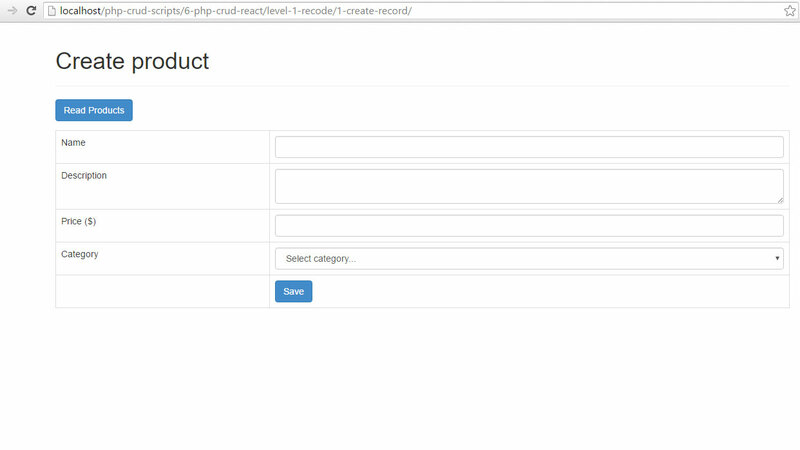 ├───read_one_product.php – will select one product from MySQL database. ├───update_product.php – will update a product from MySQL database. ├─config/ – contains PHP files for settings. ├───core.php – here we can set error reporting and timezone. ├───database.php – will connect us to the MySQL database. ├─dev/ – contains SQL file and notes for developers. ├───db.sql – import this file to your MySQL database. ├───readme.txt – important notes for developer. ├─libs/ – contains useful libraries for our app. ├───css/ – contains libraries related to styling. ├─────react/ – contains our React script. ├───────main.js – our React script can be edited in this file. ├─────jquery.js – library that will help us with AJAX requests. ├─index.php – is where our single page app (SPA) will load. ├─info.php – for debugging purposes. I assume you are using PhpMyAdmin to manage the database. If not, contact me. 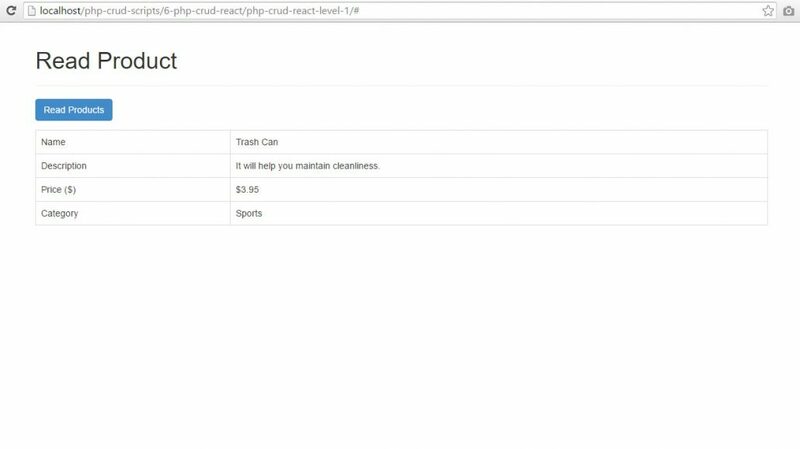 First, create a database with a name “php_react_crud”. Run the following SQL to create the products and categories table. Good job preparing the database for this React CRUD tutorial! Let’s achieve more output by proceeding to the next sections below. Create core.php file inside the config folder. This file contains other app settings such as error reporting or timezone settings. This is not required but this is a good thing to practice. Put the following code inside it. Put the bootstrap files inside “libs/css/” directory. Put the jQuery library file inside “libs/js/” directory. Create the layout_head.php file. This file will hold our page’s header HTML and CSS. Put the following code inside it. As you may have noticed, we used the CloudFlare CDN to load React and Babel in our project. This will save us some extra steps. Create index.php file with the following code. The index.php is where our app will load. Here’s the output of all we did in section 6 of this React CRUD tutorial. It is almost like a blank page. But don’t worry! 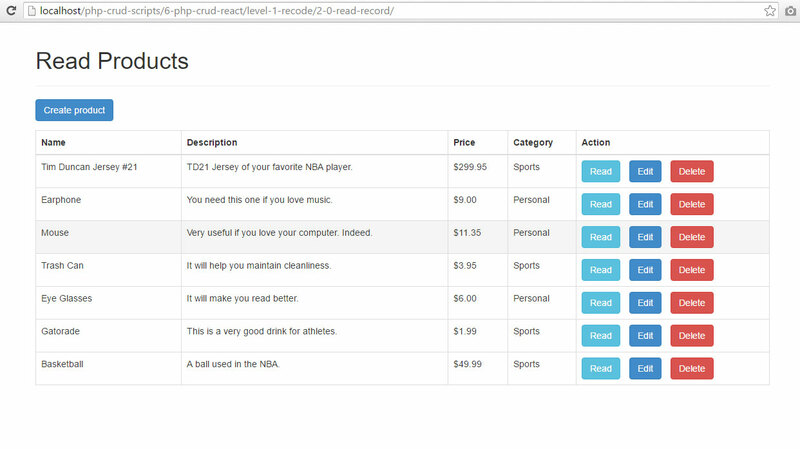 We will add awesome features, let’s continue to code by proceeding to the next sections. Create main.js file and put it inside “libs/js/react/” directory. This file will hold all our React scripts. Put the following code inside main.js, this will initialize our React DOM, also calledVirtual DOM. As you can see in the previous section, the MainApp tag was called. Now, we will create a React component class for that. Put the following code above the previous section’s code. The CreateProductComponent was returned in the previous section’s code. This component will contain the logic to create a new record. Put the following code above the previous section’s code. State is reserved only for interactivity or data that changes overtime. State is invoked once before the component is mounted. On our case, we’ll have the product categories, fields and display data. Put the following code inside the createClass function of the previous section. The componentDidMount method is invoked once immediately after the initial rendering occurs. This is where we usually perform AJAX requests. In our case, we will get the list of categories from the database using a jQuery AJAX request. We change the page title to ‘Create Product’ as well. Put the following code right after the getInitialState method of the previous section. The previous section won’t work without the read_all_categories.php file. Create read_all_categories.php file inside the “api” folder and put the following code inside it. The previous section will not work without the readAll() object method. Create “category.php” inside the “objects” folder and put the following code. The componentWillUnmount method is invoked immediately before a component is unmounted from the DOM. This is where we perform any necessary cleanup, such as invalidating timers or cleaning up any DOM elements that were created in componentDidMount. In our case, we use this method to stop getting categories data – in case the request is still loading. This is a very useful feature to make our app run smoothly. Put the following code under the code in section 7.5 above. This is how we handle changes in our state. When state changes, it means there is a change in our form input as well. We will create custom methods bound to each fields in our form. They are like ‘on change’ listeners. We will see how this is integrated with our form later. For now, put the following codes after the code on the previous section. 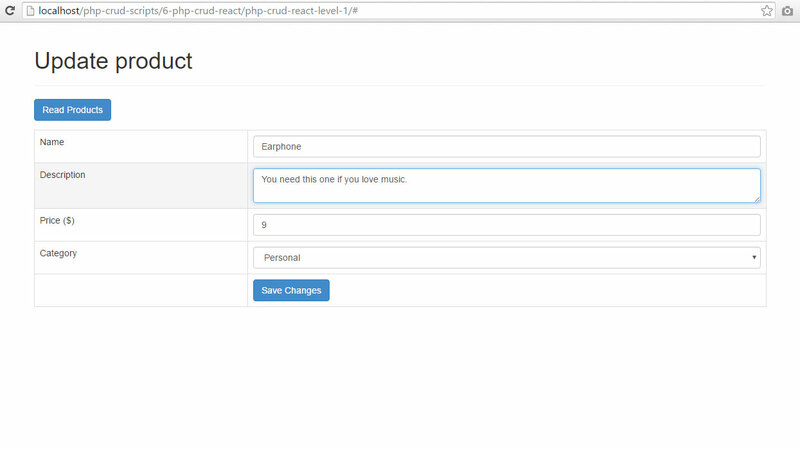 Here’s our custom method that is executed once the ‘create product’ form was submitted. We use jQuery AJAX to post the data to create_product.php file. We empty the fields once the response returned is ‘true’. Put the following codes after the previous section’s code. The previous section will not work without the product.php file. This file holds our product object class where we can call useful methods to perform tasks us create, read, update and delete products. Create the “objects” folder and create the “product.php” file inside it. Open product.php and put the following code. The following render method code does the following. Tell the user if a product was created. Tell the user if unable to create product. Button to go back to products list. Form to create a product. Put the following code under section 7.10’s code. You should have the following output so far in this React CRUD tutorial. We will now have two screens, we call it ‘mode’ in this tutorial. One for the “create product” and one for the “read product”. Now we will put values to MainApp component’s initial state. Put the following code inside the MainApp component class (and before the render method code) in section 7.2 above. The custom changeAppMode method will help set the current mode of our app, in which we currently have two modes: “create” and “read” products. Put the following code after the previous section’s code. We will change the code on section 7.2 above. We will have ReadProductsComponent as the default component. We put the switch statement there to identify the current mode of our app. By now, you should know what methods our react component class usually contains: getInitialState, componentDidMount, componentWillUnmount and render method. Our ReadProductsComponent will look like the following. You can read the code comments to learn what this component does, it should be easy to understand. If not, ask via the comments section below or email me mike@codeofaninja.com, I will answer your question. Put the following code above the MainApp (section 7.2) component. The previous section won’t work without read_all_products.php that gets data from the database in JSON format. Inside “api” folder, create read_all_products.php with the following code. The previous section will not work without the readAll() object method. Add the following code below the create() method of our “product.php” inside the “objects” folder. As you can see in the section 8.4, ReadProductsComponent renders two other components: TopActionsComponent and ProductsTable. We will add the TopActionsComponent by putting the following code above ReadProductsComponent. ProductsTable component renders our table head and body where the list of data and action buttons (read, edit, delete) will be shown. Put the following code above the TopActionsComponent code of the previous section. As you can see in the previous section, ProductsTable component renders the ProductRow component. It renders the single row product record. Add the following code above the previous section’s code. Here’s the output of all we did in section 8 of this React CRUD tutorial. When you clicked the “Create Product” button, it will show you the working form to create a product. We need to add another mode or “case” on our switch statement. It will be the “readOne” case. It will return the ReadOneProductComponent class. Our MainApp render method will now look like the following. Now, here’s the component that will render a single product data on an HTML table. The componentDidMount method in the previous section will not work without read_one_product.php, create that file inside the “api” folder and put the following code inside it. Add the following object method inside Product class in objects/product.php – this will make our code on previous section work. Here’s the output when the user clicks the “Read” button in the read mode. Add the ‘update’ case on the switch statement of our MainApp’s render method. The method should look like the following. This component contains the logic to update a product. It includes server requests to read categories (for dropdown), read single product, update a product, and the update form itself. Add the following code above the MainApp component class. Put the following code inside UpdateProductComponent class of the previous section. On mount, fetch all categories and store them as this component’s state. Read a single record based on given product ID as well. The scripts of read_all_categories.php and read_one_product.php is already done in the previous sections. On unmount, kill categories and product fetching in case the request is still pending. Put the following code after the previous section’s code. Put the following code after the previous sections’s code. This is how we handle form field changes as explained in section 7.9 above. The following code is executed when the user clicked the “Save Changes” button. Put it after the previous section’s code. The previous section will not work without update_product.php file, let’s create that file inside the “api” folder. The following code must be inside it. Tell the user if a product was updated. Tell the user if unable to update product. Form to update a product. Put the following code after the code on section 10.7 above. Here’s the output of all we did in section 10. On our MainApp component > render method > switch statement, add the ‘delete’ case. The render method should look like the following. 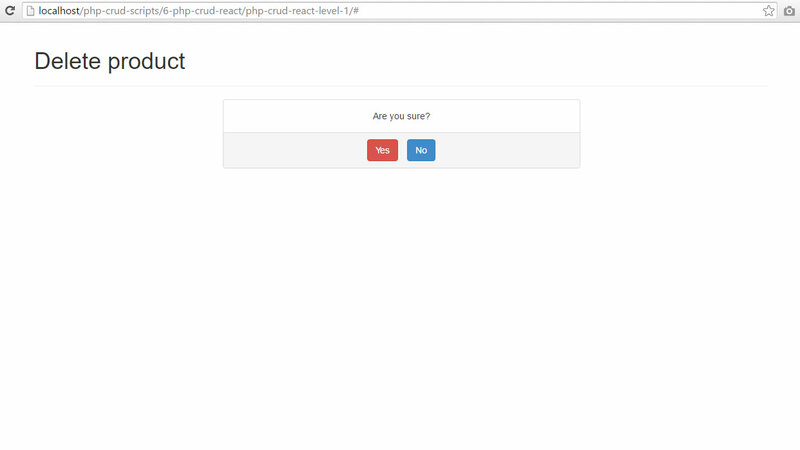 render – will show the question “Are you sure?” with “Yes” and “No” buttons. The previous section will not work without delete_product.php file. Create the file inside the “api” folder. The file should have the following code. The previous section will not work without the following method on our Product object class.